In this tutorial, we’re going to be covering how you can achieve a nice ‘glitchy twitch’ effect within After Effects without any 3rd party plugins or scripts. We will only be using the built in tools in After Effects as well as a few basic parenting expressions. After doing the ‘Breathe Life Back Into After Effects Lens Flares’ tutorial, I started to really like hooking things up with expressions and controlling them with a ‘Control’ layer, so we’ll be doing that again for this effect. To twitch in 1 axis or direction, you need to modify the wiggle expression for the Position of the RGB layers. If you want to limit the twitch to only 1 axis or direction, you need to limit the wiggle expression to 1 axis or direction. We must define each axis now that we’re trying to individually control them each. You must remember that the X axis is labeled , the Y axis is labeled , and the Z axis is labeled . The first part of the expression has the wiggle expression applied to the X axis . As you can see, the 2nd part of expression, the Y part, doesn’t have the wiggle applied, it just has transform.position, meaning it’s not going to change. The X axis is staying still while the Y axis has the wiggle expression applied to it. Take note of the bracket numbers. 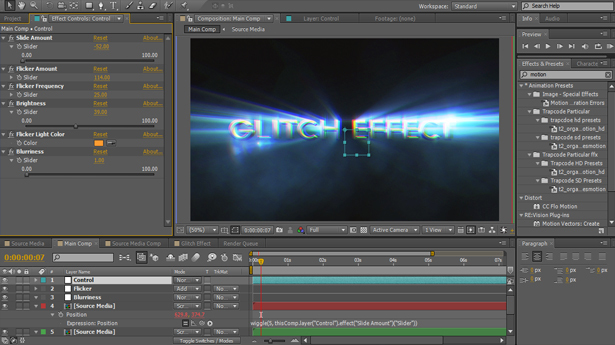 You can try various blurs for the glitching effect, such as Directional Blur. Each blur will give you different results, some looking better than others depending on what you’re trying to do. You could also try creating a masked vignette blur, masking out a vignette for the Blur Adjustment Layer, making the animation only blur around the edges to make an interesting look. Hopefully this tutorial was a little useful to you and I hope you enjoyed it. If you liked this tutorial, please leave a feedback comment down below to show some support! If you have any questions, ask them below and I’ll get to the as soon as possible.